Welcome to Something Sew Fine Quilt Design! "Let the beauty you love be what you do. I am currently transitioning from full-time professional quilt pattern designer to a laid-back occasional pattern designer, quilt artist and author. Quite honestly, I want to explore and learn so much more. I want to make time for all the things I enjoy doing and not feel guilty about taking time away from my “shoulds”. I have paid my dues - now it is time for ME! I am currently working on a sequel to “After the Storm”. 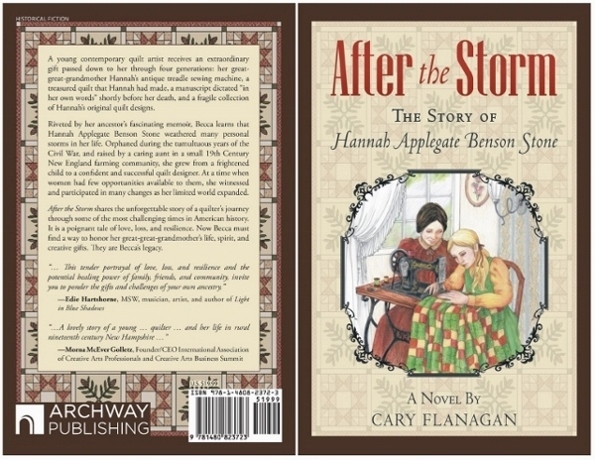 This the story of Hannah, a young quilter growing up in a New England farming community during the tumultuous 19th and early 20th century. It is a poignant tale of love, loss, and resilience. Orphaned very young and raised by her Aunt Rebecca, Hannah matures from a frightened child to a self-confident and successful quilt designer and businesswoman at a time when few opportunities were open to women. "As I left the barn, I felt the wind strengthen and the first drops of rain began to fall. I called to Sunny and told the children to wash up while I returned to the cabin to prepare dinner. "Inside our little fortress, I kept a fire blazing in the large fireplace, and two kerosene lamps shone brightly in an attempt to ward off the darkness and fury of the storm. The windows rattled ominously and the walls vibrated while all around the cabin I heard trees snapping like matchsticks and the wind moaned and howled. "Sarah and Jacob were frightened and huddled under one of my patchwork quilts near the fire. I comforted them as best I could.... I was frightened too." Available on Consignment at local quilt shops. Please note: "Moon Dance" is out of print and is no longer available from this website. My patterns are available as pdfs via e-mail - no postage and handling fees and (almost) no waiting! Simply choose a pattern, click on the 'buy now' button (ignore the box asking for your 'Destination Zip') and in the "Instructions to Merchant" (in Pay Pal) indicate you want the pattern sent as a pdf via e-mail. You may also request the pdf by contacting me through the Contact form or by e-mail. Unfortunately, because of the EU VAT (European Value Added Tax) rules which went into effect January 1, 2015, I will no longer be able to sell my patterns as pdf's to customers residing in the UK or any member country of the EU. I have been forced to put a block on any sales that are made in currencies other than US dollars. I apologize for this inconvenience. Be assured that you can still purchase any of my patterns and my book (see below) in printed form (hard copies). Those sales are not subject to the EU VAT. Contact me directly by clicking on 'Contact' button and filling out the form. You can find me on Facebook under Cary Flanagan (personal) and Cary Flanagan, Something Sew Fine Quilt Design (business). Please "Like" me by clicking on the FB button at the top of this page. Facebook is a great way to keep up with what's going on in my life and my work and to get to know my quirkier side! See you there! My quilt patterns are published and distributed by Nancy Dill Designs, Inc. d/b/a QuiltWoman.com publishing Co.
All purchases may be paid for on-line through Pay Pal. You may also pay by check. Any purchase made by check will be shipped after the check clears. Shipping/Handling will be added at checkout or by arrangeement for packages being sent outside the United States..
To find out more about me and my work, please click About Me. Feel free to Contact Me with any comments or questions you may have. I would love to hear from you!